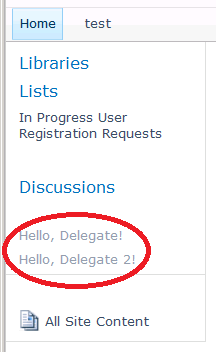 I have been playing a lot the last little while with SharePoint 2010 Delegate Controls. I have known about them for a ling time, but have never really delved into them all that much. Last week, I used a delegate control for something a little different. For a project I am working on, the client wanted some functionality displayed just below the Quick Launch, on every page in the site collection. I know there are lots of ways to do this (put a user control on the master page, put a web part on the master page, or just put links on the master page, since that’s all the content was in this case). But then I thought of a little bit more elegant (to me) solution. 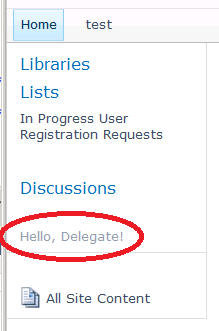 Rather than explicitly putting the content on the master page, I added a delegate control of my own to the page, and placed it just below the Quick Launch, as shown below. I included default content in the <Template_Controls> element, so that I could see it change when I activate a Feature with an appropriate control. I created an appropriate elements.xml file to map my control to the Delegate Control’s ControlID. But wait, there’s more! Remember that I set AllowMultipleControls to true? That allows me to deploy multiple features with controls that map to my ControlId, and instead of only displaying the one with the lowest Sequence attribute, it will stack them all in order of Sequence number, as shown below. This means that I can add any number of things to the area under the Quick Launch without further customizing the the Master Page. 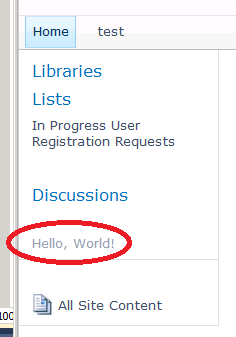 Maybe I am just easily amused, but I thought that was pretty neat! The source for this, including the master page, is available here. Please keep in mind that any opinions, points-of-view, comments, or other content which I post to this site are mine and mine alone. They in no way reflect the views of my employer, my country, my dog, my cat, or anyone else you can think of. To paraphrase Monty Python, "That is the theory that I have and which is mine, and what it is, too."